My husband Nazim Artist has created a new artwork which is an acrylic on canvas, entitled, “Goddess” and I have translated this image to some fun wearable art items and home decor, which Nazim and I hope you will like. The collection featuring this new artwork is live at Nazim’s VIDA webshop now! 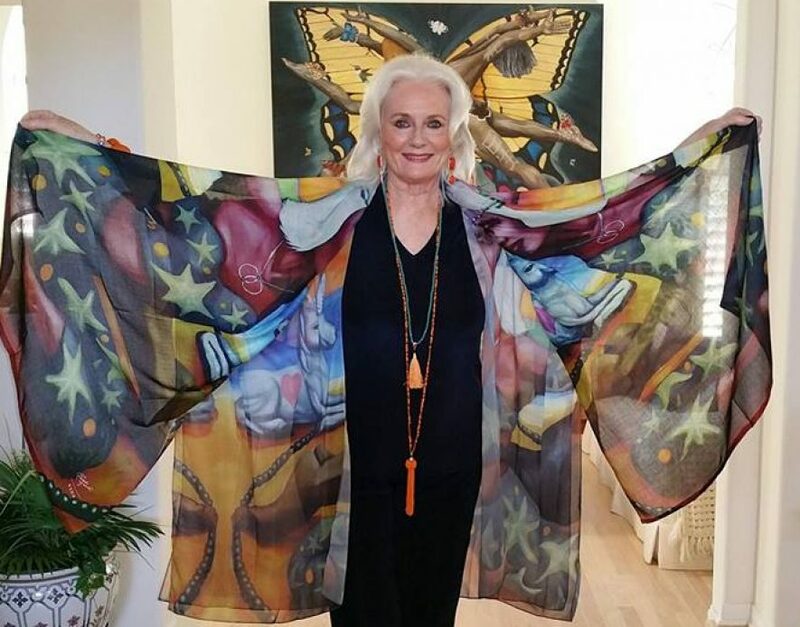 The first item to share is the Goddess large Silk Square Scarf which is lovely to wear, around our neck, tied on to a hand bag, or worn in your hair but it’s also suitable for framing! The items above are the Goddess Essential Top and Yoga/Capri pants and a cute “Fold a Way Tote bag to take along to yoga or exercise class and also to take on the go for shopping excursions! Above is a pendent style necklace which comes in both silver and gold electroplate but I really like the gold tone for this item but you choose what you like best. The chain is a long one so you can layer this necklace with many others from your own collection including pearls! I have also designed a leather Statement Clutch in the Goddess artwork to pop into your VIDA “Fold a Way Tote” bag seen above or your favorite bag or just to carry on its own! Here is a really fun Tee and also a mirrored Modal Long Scarf in the Goddess motif as well. Nazim and I hope you enjoy these items and we so appreciate all your support of our VIDA webshop(s)!